The first chapter of the book introduces our key question: how can private actors be incentivized to share their data in a way that promotes the public value of the information disclosed? We are interested in whether and how these different organizations can be encouraged by governments and other interested actors to share the information that they hold. The means by which this might be accomplished—particularly how these private actors might be encouraged to collaborate among themselves and with governments—is a major focus of the book. 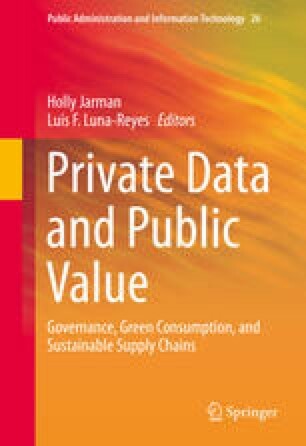 The chapter explores the concept of public value in the context of data disclosure by private organizations, using empirical evidence from the I-Choose project. We argue that while disclosing product information can enhance the public sphere, information disclosure alone is not enough to guarantee this. Disclosure must be supported by innovative governance mechanisms. The chapter explains why disclosing private product data is considered valuable by some policymakers and advocates and considers the barriers to disclosing product information.